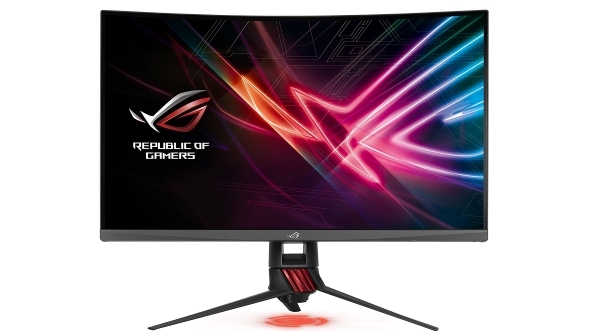 Asus’ Republic of Gamers monitors are some of the best around. Mixing top-quality panels with excellent electronics and a touch of Taiwanese design flair. You know what I’m talking about – just check out those RGB LEDs. And the Asus Strix XG32VQ is a big-screen beauty with a decent price tag, high refresh rate, and FreeSync support. GPU prices are slowly returning to ‘normal’ so check out our pick of the best graphics cards to plug your screen into. The first time I sat in front of a 32-inch monitor I could barely comprehend what I was seeing. A Windows desktop writ large over such an expanse of screen real estate was initially overwhelming. But time, she does not wait, and now anything below 27-inches across the diagonal feels like staring at a moving postage stamp. It’s surprising how quickly the ‘wow’ factor of a big screen monitor goes away as you become accustomed to what initially seemed to be an endless vista. For the PC gamer, we happy few (many? ), sitting directly in front of our monitor, the gentle curve that offers little but distorted reflections to the console gang on their TVs actually delivers an extra touch of immersion. You’re pretty much always going to be in the sweet spot for that mild wraparound view, so any distortion can largely be negated. Well, so long as you’ve a decent panel in place anyways. And, thankfully, Asus’ ROG Strix XG32VQ does. It’s not using the glorious IPS panels of the Swift range, but the VA technology they’ve dropped into the big-screen Strix is bright, clear, and responsive. And it still makes any TN screen you put near it shrink back in fear and shame. Because of Asus’ impressive monitor electronics know-how, the XG32VQ comes out of the box in fine fettle, calibrated in perfect shape for all but the most serious image manipulators. But then they’re going to be chasing IPS perfection if they haven’t already spent their life savings on a tiny OLED screen for their PhotoShop work. There are, of course, a host of different settings you can switch around, should you so please, but there are compromises to pretty much all of them. Out-of-the-box the contrast is impressive, offering clear delineation between different shades of colour at both the darkest and lightest ends. But as soon as you turn on scenery, or FPS mode, you immediately lose any detail at the brightest tones. Strangely, for a VA panel, the black levels are a little aggressive, making it tough to distinguish between different areas of darkness. The game settings will help here, but you’re then breaking the top-end contrast and washing out the otherwise impressive white saturation of the screen. There’s a rather strange MOBA mode in the XG32VQ’s settings too, which essentially flattens every colour to grey, except for red and green. The idea is to make certain important characters, or parts of the battlefield, stand proud, ironing out any potentially distracting colours. You know how easily MOBA players are distracted by a vibrant shade of blue… it’s like a red rag to a bull, or a puce hanky to a StarCraft pro. The most important feature to make sure you’ve got running with the XG32VQ, however, is the refresh rate. It’s absolutely vital that you run this screen at its native 144Hz, otherwise I’ll find out where you live and adjust your settings myself. And when I set you, you’ll know you’ve been settled. 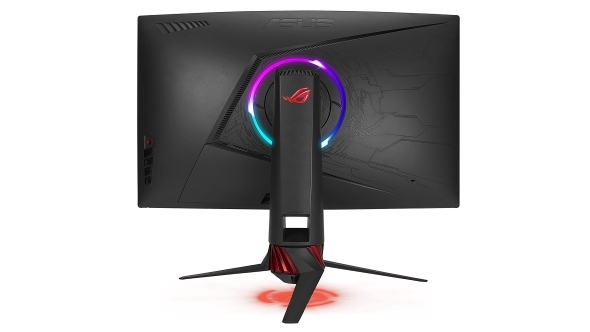 With the screen running at 144Hz, and the AMD FreeSync support plumbed into a compatible Radeon GPU, the gaming performance of this Strix monitor is stellar. Its motion is clear and smooth, without a hint of ghosting in even the most fast-paced shooter. There’s no hint of a bleeding backlight – the bane of the Big F**mat Gaming Displays I’ve checked out so far – and the viewing angles are excellent. 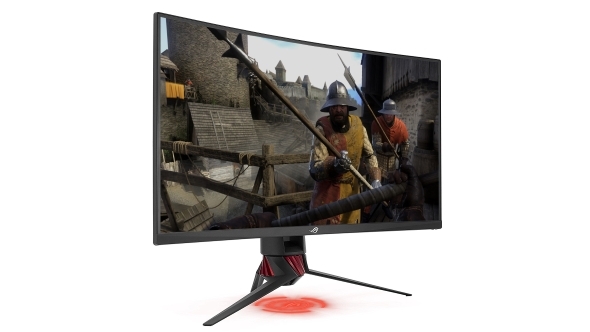 As a FreeSync monitor you’re not getting G-Sync support, but that means you can pick up this screen for around $700 ($550) which is a pretty good price for such a well-featured, curved 32-incher. Obviously, finding a compatible graphics card if you don’t already have one is a bit of a tricky issue right now, but things are showing signs of getting a little better. I’ve mostly typed lyrical about the panel and the electronics, but the Strix XG32VQ’s chassis does deserve a little mention. Asus’ angular ROG designs can be divisive, but the Strix almost seems like them being a little restrained… well, until you stand behind it. In a move surely designed to bug your LAN party nemeses Asus have created a glowing ring of RGB LEDs on the rear of the monitor, with a down-firing LED – with replaceable lenses – beaming out from the base. But forget the LEDs for a minute (I know, heresy) because the front of the chassis is just as – if not more – pleasing. With a pseudo bezelless finish on three sides there’s only really a single ROG logo’d bar along the underside of the panel. The screen doesn’t go fully to the edges of the chassis, but there is really no unsightly bezel to speak of. Asus’ big-screen 32-inch Strix monitor is a quality gaming panel and one of the best FreeSync monitors I’ve had the pleasure of toying with. The image is bright, crisp, and wonderfully clear, even in the most frenetic of FPS, and it’s not a bad price either. Though, with the current cost of graphics cards, everything looks relatively affordable by comparison.